Josh Waters got the better of Wayne Maxwell in an enthralling game of cat-and-mouse today, winning the final round of the QBE Australian Superbike Championships by the narrowest of margins. 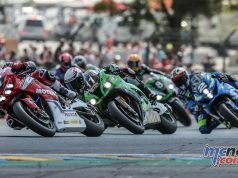 The point for pole position, earned in difficult conditions yesterday, proved crucial as Waters and Maxwell rode to a win and second place each. 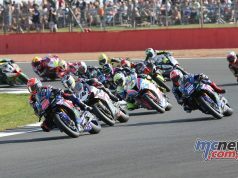 The Team Suzuki rider led from start to moments before the finish in race 1, when Maxwell, biding his time, made the race-defining move over Lukey Heights. Waters attempted to come back at Maxwell on the fast front straight but missed out by just 0.087 seconds. Their pace was unmatched, with Glenn Allerton crossing the line on his Procon Maxima BMW almost 15 seconds behind. A difficult qualifying result was compounded for Team Honda rider Jamie Stauffer, who was lucky to re-mount his bike after a dramatic highside crash exiting the turn 4 hairpin. Despite his best efforts, Stauffer would go on to DNF a few laps later, along with Ben Attard whose i-Style Natural Aprilia suffered a mechanical problem mid-race. Race 2 was shaping up as a carbon copy of the opener, but as the laps ticked down the GSX-R1000 stretched its legs and began to gap the CBR1000RR. Waters went on to win by 3.478s, with Stauffer a courageous third. “The bike was fast in practice and qualifying and it was great to be able to get away from pole position today,” said Waters. “Race one was a real battle with Wayne, he stayed with me the whole time and got the job done on one of the last corners of the race. “When the tyres go off like they do in these races its hard to make ground, so I thought if there was any time to make a break, it would be in the first laps of the second race. Maxwell was disappointed to miss out on a second race win and vowed to work harder than ever in the off-season to hit the ground running in 2012. “It’s a pretty strong finish to the year after our 200km/h crash on Friday, I’m happy just to be here let alone get a race win and a second,” said Maxwell. Both Waters and Maxwell scored points in just 6 of the 8 rounds, with Waters absent on World Superbike duties and Maxwell suffering a spate of DNF’s. They made solid progress up the championship standings today to both finish in the top 5. Wrapping up third for the round and the championship was Team Suzuki’s Troy Herfoss. Herfoss has impressed in his rookie year, and rued a mid-season slump as a missed opportunity to challenge Jamie Stauffer for second overall. He finished just a point shy of the runner-up place and has made his intentions clear as a championship challenger in 2012. “It’s been a great weekend at Phillip Island,” said Herfoss. “It’s been stressful, the wind today and the different conditions over the last few days. “We’ve been in a tight battle for second, third and fourth with the two Honda’s and I was lucky enough to come away with third today and in the championship. A courageous showing by Stauffer saw him finish third in the second race, despite the obvious discomfort from his earlier crash where he severely grazed his chin. Kevin Curtain was confirmed as the 2011 QBE Australian Supersport Champion today, but not before a number of nail-biting moments unfolded. He entered the event with a healthy lead over Team Suzuki’s Brodie Waters, but as Waters stormed to the race 1 win and Curtain struggled to seventh, the championship closed up considerably. Waters holeshot the second race, giving himself every chance at the title, but Curtain’s Yamaha Racing Crew had smartened up his R6 and he was able to hold on and score the points he required to wrap up what has been another successful season. “The crew made some good changes to the bike between races and it felt a lot better,” said Curtain. “I got off to a better start this afternoon and was able to hold onto third. WNR Kawasaki’s rising star Glenn Scott showed he will be a true force in future seasons, taking his first Supersport race win to go with a second place. The result saw him 1 point shy of the round victory, taken by Waters, who was clearly disappointed to miss out on a maiden Supersport crown. Curtain’s winning margin in the end was just 7 points, with Yamaha privateer rounding out the championship podium in third, and first privateer, after a consistent year. Yamaha supported road racers have enjoyed success at Phillip Island as the final round of the 2011 ASBK championship hit the checkered flag for the final time this year with the blue squad locking up three national championships. Yamaha Racing Team’s (YRT) Kevin Curtain won the 600cc Supersport Championship on his R6, Cru Halliday claimed the Pro Stock class on the R1 while Mike Jones already had the 600cc Superstock class in his keeping from the previous round. The 2011 season for Kevin Curtain will be etched in his memory banks as he now adds the 600cc Supersport Championship to the four FX Nationals championships he claimed earlier this month. Curtain went into the final round with a comfortable 21 point margin over his nearest rival and another intelligent day of racing was all that was needed from the veteran to get the job done. But things didn’t pan out as planned as Kevin raced cautiously to protect his championship lead in the opening leg and the swarming pack smelt blood in the water. Curtain clung onto seventh place, but his lead had almost been cut in half and the pressure was on for race two. Race two and his mentality changed. Curtain took the attitude to forget the championship and deal with the race. He jumped much better and was in contention in the early stages but as the race wore on, the pressure grew as the pack formed around him. But Curtain remained calm, focused on the job at hand and raced his R6 across the line in third place and secured the 2011 600cc Supersport Championship to the relief of the YRT crew. “A day like today shows just how important a good team is around you and the YRT guys have been awesome. Thanks to them we managed to get this championship and I couldn’t have done it without them,’ Curtain says thankfully. Curtain’s YRT team mates also put up a good showing at Phillip Island with Pat Medcalf taking second for the round in the 1000cc Pro Stock class while Rick Olson landed in third spot for the day on his R6 in the 600cc Supersport division. Cru Halliday put his name alongside another championship with victory in the 1000cc Pro Stock class. Halliday compiled 7-1-2 race results in the three legs to finish third for the round in a very congested leader board that saw the top four riders separated by two points. While the podium result was nice, Halliday took a 64 point margin into the final round and essentially just need to circulate in the top 10 of each race to claim the championship win. “Today was some good racing and enjoyed the challenge of racing with the guys. The bike was good all weekend and to secure the championship was good,” Halliday said. Mike Jones had already wrapped up the 600cc Superstock division and didn’t contest the final round. The 2011 Australian Superbike Championship proved successful for Yamaha taking three of the four production based championships contested this year. These results are further proof of the quality and high performance of the R1 and R6 machines. The Phillip Island round was the final race commitment for YRT, and the crew will now take a well earned rest before tacking 2012 with equal gusto and enthusiasm.